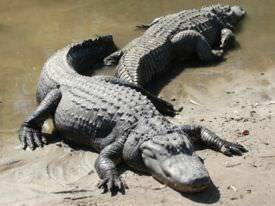 Crocodiles have long and pointed, V-shaped snouts while alligators have rounded, U-shaped snouts. Other differences include the shape of their jaws and hind legs. Their behavior is also starkly different, with crocs being more aggressive than gators. Alligators have a wide "U"-shaped, rounded snout (like a shovel), whereas crocodiles tend to have longer and more pointed "V"-shaped noses. In alligators, the upper jaw is wider than the lower jaw and completely overlaps it. Therefore, the teeth in the lower jaw are almost completely hidden when the mouth closes, fitting neatly into small depressions or sockets in the upper jaw. This is called an "overbite". The large fourth tooth on each side of the alligator’s lower jaw fits into a socket in the upper jaw. However, in crocodiles, the upper jaw and lower jaw are approximately the same width, and so teeth in the lower jaw fit along the margin of the upper jaw when the mouth is closed. Therefore, the upper teeth interlock (and "interdigitate") with the lower teeth when the mouth shuts. The large fourth tooth on each side of the crocodile's lower jaw projects outside the snout when the mouth is closed. Crocodiles have a jagged fringe on their hind legs and feet; alligators do not. Alligator have webbed feet; crocodiles do not. The American alligator is the larger of the two species of alligator and typically ranges from 6-12 ft but can grow up to 19 ft. The Chinese alligator is smaller, typically about 5 ft with a maximum length of about 7 ft.
Crocodiles are the largest and heaviest of present-day reptiles. The Nile crocodile (Crocodylus niloticus) of Africa and the estuarine (or saltwater) crocodile (C. porosus) of Australia are the largest species; they can grow up to 20 ft in length and weigh over 1,000 kg (about 2,200 pounds). 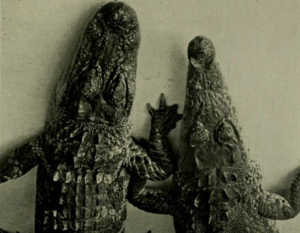 The smallest species, the smooth-fronted caiman (Paleosuchus) and the dwarf crocodile (Osteolaemus tetraspis), reach about 6 feet in length as adults. Differences in behavior are also apparent. Most people regard crocodiles as more aggressive than alligators, and this is true of some species. 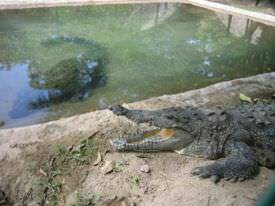 When cleaning alligator pools, some zookeepers can tread on alligators without eliciting a response, though crocodiles almost invariably react aggressively. Alligators prefer freshwater while crocodiles can better tolerate brackish water because they have functioning salt glands on their tongue. This allows crocodiles to easily filter out salt. 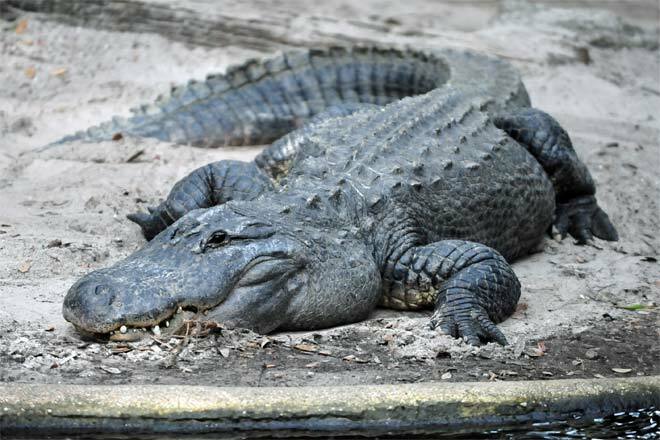 While alligators also have these structures, they appear to have lost the ability to use them for excreting significant amounts of salt and hence preferring to stay in freshwater areas. 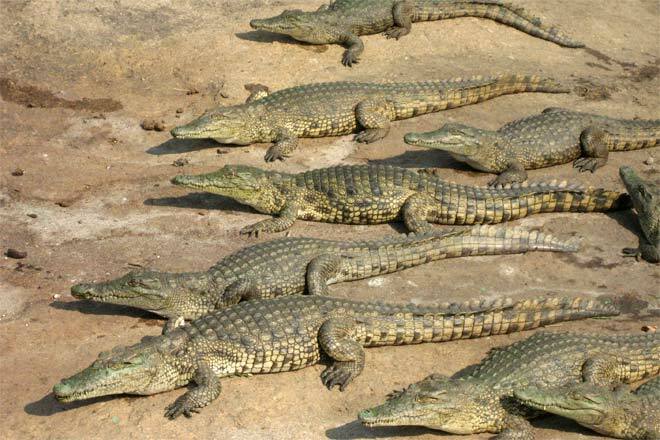 Crocodiles and alligators are both reptiles belonging to the order Crocodilia, who have been in existence for over 80 million years. 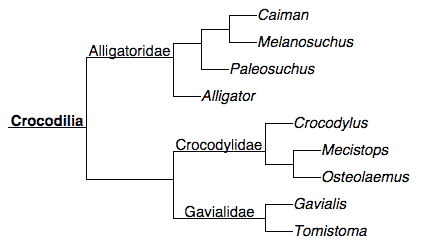 Evolutionary tree for Crocodilia, an order of reptiles that includes both alligators and crocodiles, among other large predators. Interesting, eye-opening, and informative article. they seem pretty alike but they are totally different from each other. Another difference is that alligators are born with an extra toe than crocidiles but during their adolesence, they shed off the extra toe.